They say the Navy molds boys into men -- and then after your manhood's gone, Carnival's Boyz II Men "Love Cruise" can take you to the End of the Road. 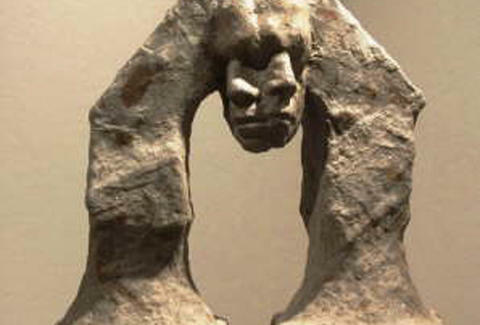 Molded by the Navy and now molding art: Mark Mueller. Mort: Wielding a quill pen, this bronze skeleton's supported by strings as if on display at a natural history museum, where he'd probably be great friends with another dead person, Ben Stiller. 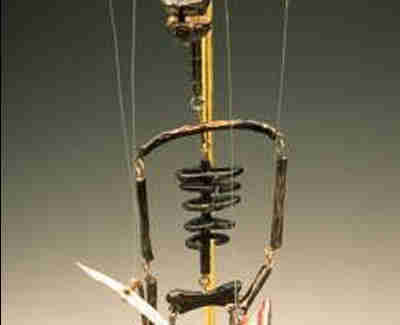 Los Diablos: At once rigid and organic, this 5ft-tall, red, yellow, and blue piece's flat-paneled sides are topped by antlered and Skittle-ized Blue Man Group heads; beneath each thrusts a colored screw dangling a single, Kruk-ian ball, reducing the urgency for women to get their Tubes Rewired. Blue Man humor! 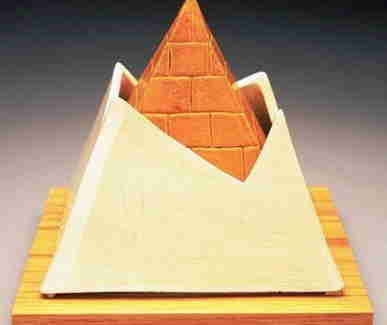 Hope II: Resting on a wooden platform, this 6in-cubed ceramic & wood pyramid is partially encased in a larger pyramid, almost as if it's hatching, but not Richard Hatching, because that dude doesn't have enough celebrity friends to be able to afford a pyramid. Mueller also has a series of faces that are, depending on the piece, emerging from a vessel, merged into two, or crushed -- just like the Boyz, after realizing they'd gone from "I'll Make Love to You" to watching Dad bust moves while Mom catches air. Whoa!